Join.me, an online meeting service from LogMeIn which serves as a more lightweight alternative to traditional services like Cisco’s WebEx or Citrix’s GoToMeeting, is adding a trio of features designed to better support its business users, including the ability to record meetings from web and iPad, share those recordings with others, and maintain an online file store with all the necessary meeting materials, like presentations, notes, photos, and more. Some of the changes are being made possible through a new integration with LogMeIn’s Dropbox alternative, Cubby. You may remember that Cubby, which opened up to the public this past November, had been attempting to differentiate itself from others in the competitive online storage market by offering not just storage, but also a syncing service which lets you drag-and-drop or right-click on folders to either add them to the cloud or just sync them between devices. The unique feature is something called “DirectSync,” which lets you sync folders directly across both web and mobile devices without counting toward your online storage limits. Cubby has always been positioned as more of a business or enterprise-ready product, and today’s integration with LogMeIn’s Join.me continues its focus in that direction. Now, Join.me users will be able to record their meetings from the web, the PC or the Mac desktop apps, as well as through Join.me’s iPad app, which is currently pending approval for release in the iTunes App Store. Using the new recording option is simple enough – you just click a “record” button to get started. The meetings are then stored in an online “Cubby,” which you can access either through Join.me or via Cubby directly, using your same login information. 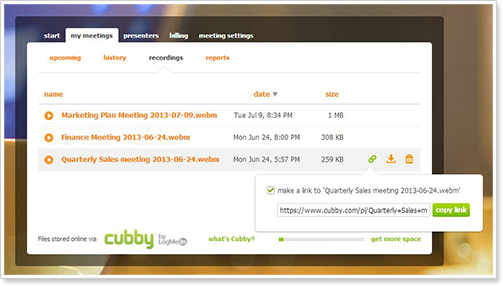 Those meetings can be share with others via a link, or by inviting them to the Cubby service. The meetings are recorded in .webm format, and can be played in natively in Chrome or Firefox, in other browsers via a plug-in, or directly from Join.me itself. The meeting recordings show up online in about half the time of the meeting itself – so for example, a 60-minute meeting would be available online in around 30 minutes. Meetings recordings will be a feature for Pro users, the premium version of Join.me that starts at either $13 or $19 per month, depending on whether you pay annually or on a month-to-month basis. This package now includes 5 GB of Cubby storage for meeting recordings. This is the first time LogMeIn and Cubby have been integrated, and should prove to be another key differentiator for Cubby’s cloud storage service. In addition to supporting meeting recordings, the forthcoming update to the Join.me iPad app will also include the ability for users to host a meeting, share what’s on their iPad, and save the meeting recordings to the cloud via Cubby. Then, in a few weeks’ time, Cubby will roll out some features to complement these new integrations, with the launch of dedicated meeting and team “Cubbies.” Here, content can be added and then used during and after meetings. This content can also be secured with the appropriate permissions, and the new Cubbies will offer automated meeting recaps, where participants are sent all the files, the meeting recording, and various tasks discussed during the meeting, after it wraps. LogMeIn is company whose name recalls its past as a maker of tools which let users remote in to access their work computers at home and vice versa – a necessary feature in the days before online storage became so ubiquitous. Now it’s trying to reinvent its business for the cloud era amid a lot of competition. Join.me is one we see here a lot around TechCrunch, as it’s a simple way to get a quick demo of an app without all the software downloads and complicated setup procedures. Plus, the service has a popular free tier, which helps when startups are strapped for cash. But to take on the corporate world, the company will have to beef up its feature set to be competitive with what’s out there, and integrating with cloud storage, and adding support for recordings plus meeting hosting from iPad are good first steps in making its service more useful. Many companies feel that the online meetings space can be improved, including even WebEx’s co-founder who launched Moxtra this year, in order to take advantage of the iPad’s potential. Others in the same general space include Fuze, UberConference, and BlueJeans, to name a few of the newer entrants. Though LogMeIn doesn’t disclose how many users Join.me or Cubby has on its own, the company says that it has “tens of millions” of actives between the two, and is adding over 2 million first-time users per quarter (first-time Cubby activations or first-time Join.me hosts). The two are today the fastest-growing products in LogMeIn’s lineup, in terms of new users and sales. The ability to record meetings is live now, via Join.me on the web, with the iPad app due out soon.